Providing a secure workplace is a vital concern for employers but presents a definitive challenge. According to the U.S. Bureau of Labor Statistics, 2 million American workers report having been victims of workplace violence, with aggravated assault being the most common offense followed by rapes and sexual assaults, robberies and homicides. While active shooters, such as the recent shooting at the YouTube Headquarters in San Bruno, Calif., and the mass shooting at the Inland Regional Center in San Bernandino, Calif., are among the most highly-publicized cause of workplace violence and death, the most common motive for job-related homicides is robbery, which accounts for about 85 percent of fatalities due to acts of violence in the workplace. The fact that the potential for workplace violence can come from both internal and external sources makes the solution even more complex. Recognizing this challenge, the Electronic Security Association (ESA) brought together two leading experts to discuss ways businesses can use security technologies help detect and deter the potential for violence in the workplace: Cathy Rempel, President of American Security Integrators, and Gregg Katz, Business Solutions Executive at RFI Enterprises. What security technologies and/or systems can help employers provide better security for their workforce? Most large enterprise systems have a robust security suite. They have access control at all locations. They also have video surveillance and security guards at main entrances. However, access control is great until someone swipes their card and a person, co-worker or not, just walks in behind them without swiping a card. We call this tailgating. Preventing employees from allowing someone to enter behind them is critical. Better yet, devices like turnstiles and tailgate detection devices can trigger an alarm if someone enters without swiping an access card. If this person presents a threat, these devices can trigger communication technologies such as SMS messages directly to employees’ phones, email, intercom systems and even panic buttons can alert employees to the threat. With active shooters for example, the threat is intentional and in many cases the shooter has identified their targets. As my colleagues who focus on security for educational facilities have noted, early detection and mass notification is key in an active shooter situation. Once a shooter has access, every second counts – and those seconds can save lives. A system should be designed to carve out those seconds to help mitigate a shooter’s ability to inflict harm and give first responders time to engage. Also, the quicker you know the threat and where the threat is, the quicker you can direct employees to take appropriate action, whether it’s to shelter in place, evacuate or go to a previously-identified secure place within the facility. Turnstiles or active gates designed for businesses that require an electronic access card for entry are also effective. They limit the ability for an unauthorized person to enter the building without security being alerted. Each building has its own challenges and considerations. Working with a respected security integrator is key to discerning areas of exposure and developing a plan for prevention and event related action. 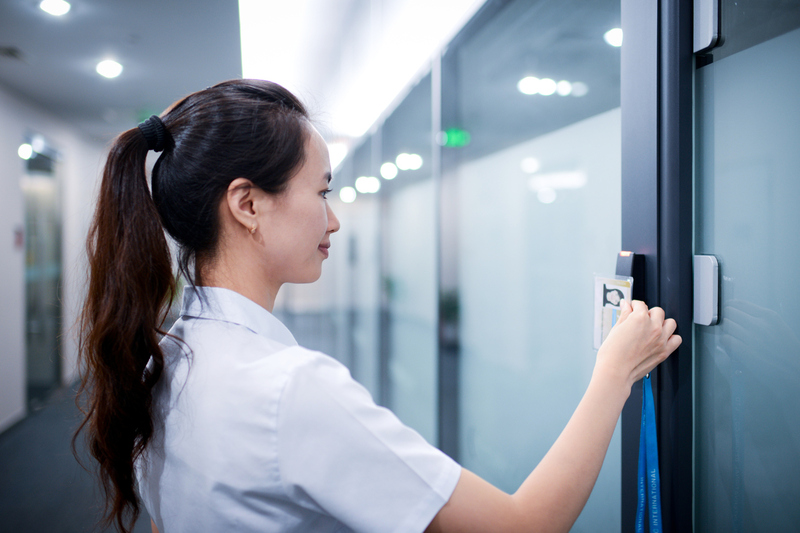 Access control is a key component of workplace security for both small and large businesses. To be effective, however, any access control system requires consistent management, close attention to detail and employee training. Access cards and employee badges must be kept up to date. If an employee resigns or is dismissed, their electronic access code needs to be deleted from the system, their access card, employee badge and keys should be collected. It is also important to have a visitor registration log and easily identifiable visitor badges. Employees should be trained to report anyone in the building without the appropriate identification. When a visitor leaves, their badge should be collected, and their departure recorded. Additionally, employers should consider emerging technologies that combine access control, video analytics and unmanned guard stations with emergency response systems. In many organizations, we still see employees lending out their cards or misplacing cards, which can provide access to unauthorized and potentially dangerous individuals. With video analytics, cards can be linked to surveillance to ensure the right person – and only that person is entering a secure area. Smaller companies that do not have a receptionist to greet and register visitors can use something simple like the chime that is probably already a part of their alarm system to alert employees that someone has entered the office. Video intercoms also can be useful for small businesses. Train employees so they know how to use the intercom system and develop a consistent greeting that is warm and friendly so customers feel welcome. Most importantly, however, make sure employees can identify a visitor before they permit entry. This can be done with something as simple as a video camera facing the entry way or video doorbell. There are unmanned security systems and advanced video surveillance technologies – both of which can make a significant difference in terms of deterrence. They can also serve as a source for forensic details, which is an important tool for your security team and law enforcement. Unmanned systems can provide a security presence for businesses that don’t necessarily have physical manpower or financial resources readily available. These systems are more affordable than they have been in the past – and offer facial recognition, access control, recording and emergency alert systems. Video surveillance, when combined with signage, analytics and audio capabilities, can be effective – especially in detecting and deterring loitering around your business as well as detecting individuals who may present a safety threat to employees working late at night. For example, if your video surveillance detects a person or group of people loitering around your business after hours, video analytics in conjunction with IP speakers can alert the loiterers that they are under surveillance and their actions are being recorded. Businesses can do this with a pre-recorded message or through a monitoring center with a live video feed. If potential criminal activity is detected, the monitoring center can issue an audio warning: “Hey, you in the red shirt. I see you, you are being recorded, law enforcement has been alerted and are on their way.” This type of technology has come down in price to a point where it is more affordable. Once a crime has been committed at a workplace, how can an employer’s security system be used to help law enforcement identify, apprehend and prosecute a suspect? Proper cameras, properly placed and installed correctly are crucial. There is a difference between situational awareness and capturing an identifiable image. For example, a parking lot camera needs to encompass (or see) the whole parking lot. However, it also needs to be able to capture identifiable footage in low lighting situations. Exterior cameras need to be higher megapixel cameras because you’re trying to cover a larger area. If you zoom in on a picture that’s not high megapixel, it is grainy or pixelated by the time you get to the item of interest. In a court of law there are certain requirements, and pixels per square inch are often a part of those requirements. Just because it looks like a really good image and you are happy with, it doesn’t actually mean you have a prosecutable image. If you have a small business, this heightened level of situational awareness may not be what you need. But if you have a larger company, you have more employees you are trying to secure and more liability. Also, deterrence is one of the main reasons businesses install security systems. Most crime is opportunistic – perpetrators are looking for situations where they can easily steal something and get away with it. If you take that ease away, you can often mitigate the risk. Law enforcement officials are looking for factual information – and high-quality video surveillance footage is at the top of the list. Video surveillance needs to be in your vulnerable areas such as your entry points and your exit points – as well as in offices or areas where cash or product may be vulnerable to theft. You also need to have a reliable video storage system in place. Video analytics are also helpful – facial recognition and license plate recognition are factual pieces of information law enforcement can use. By integrating video surveillance with access control systems, law enforcement can match the badge or the code of people coming into your company with a visual image. Simple visitor logs can also be a helpful resource for law enforcement. A strong partnership between the security integrator and central monitoring station is imperative to ensure the security solution being provided is specific to your needs and consistent with industry regulations. Monitoring stations today can manage many of the analytic responses and storage requirements, as well as the technicalities of your access control system to ensure badges and cards are accounted for and up to date. For your security system to be effective as a documentation tool, you need the different components and technologies to integrate seamlessly. For example, if your access control and your video camera system are on separate devices or originate from separate manufacturers and the time stamps do not synch correctly, you no longer have factual information. Each camera has its own time stamp as well. If you are watermarking footage with a time stamp, you need to make sure all your cameras are working off the same time stamp, are time stamped correctly and synched with your access control system. These are the types of details that are often overlooked, but highly crucial for documentation. It is also why you need to do your research and retain a reputable company with technicians certified to install and maintain the equipment. Rempel and Katz emphasize employee training as the most important component of workplace security. To sum up the advice from our ESA experts, it is people, process and technology working in tandem that provides an effective workplace security strategy. NOTE: Many local law enforcement departments have video surveillance registration programs where businesses can voluntarily enter their video surveillance systems into a database so authorities can easily identify cameras that may have captured footage from a crime. This saves precious time when trying to get a criminal off the street, because police don’t have to spend as much time canvassing an area for video footage. ESA encourages businesses to contact their local law enforcement office to determine if a video surveillance database has been established in their community – and if so, enter their video surveillance system into the database. Businesses are encouraged to always ask if a company is a member of the Electronic Security Association (ESA) and if its employees are trained by ESA’s National Training School (NTS). ESA member companies, whose security professionals are certified through NTS have completed extensive training in electronic security and adhere to a strict Code of Ethics and Standards of Conduct. Members of ESA can be found by searching the Alarm.org database. Established in 1948, the Electronic Security Association (ESA) is the largest trade association in the United States representing the electronic security and life safety industry. Member companies install, integrate and monitor intrusion and fire detection, video surveillance and electronic access control systems for commercial, residential, industrial and governmental clients. In cooperation with an alliance of chapter associations, ESA provides technical and management training, government advocacy and delivers information, advice, tools, and services that members use to grow their businesses and prosper. Together, ESA member companies employ more than 500,000 industry professionals and serve more than 34 million residential and commercial clients. Gregg is a Business Solutions Executive for RFI Enterprises. He has more than 20 years of industry experience, which includes working in the field as a technician and project manager, as well as internally as an operations manager and sales executive. RFI Enterprises is a diversified multi-systems integrator that has been designing, installing, servicing and monitoring, technology-driven security and fire/life safety solutions for more than 35 years, doing business across the United States, with offices in California, Nevada and Washington. Cathy is the president and founder of American Security Integrators, a San Diego based security company. She is the immediate past president of the California Alarm Association and former president of the San Diego Security Association in addition to actively been involved in the security industry as a keynote speaker, trainer and executive coach. Rempel has spoken and worked with several groups, associations and companies in the security industry including the California Alarm Association, Electronic Security Association, San Diego Security Association, Electronic Security and Technology Association, International Association of Chiefs of Police, American Society for Industrial Security, Security Industry Alarm Coalition, International Security Conference and the Electronic Security Expo. She has served as a consultant and trusted adviser to many security integrators across the nation enabling her to have unique insight into industry best practices and trends.